RUSSIAN FEDERATION: Stuck in transition! Russian economic growth came to a near standstill in 2013. The country is ‘stuck in transition’. With traditional growth drivers exhausted, there is little prospect for a renewal of growth without a new decisive reform push. GDP growth forecasts were revised downwards accordingly. The wiiw baseline scenario assumes a continuation of the negative contribution of real net exports to GDP growth and, in nominal terms, reductions of the trade and current account surpluses. 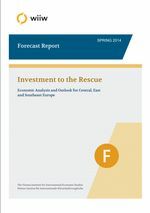 We expect a revival of investment and an ongoing modest expansion of household consumption. Inflation and unemployment will gradually diminish.